Modern Contract Management Solutions typically allow you the user to perform numerous configurations to address your needs. This is certainly the case with Contract Guardian. Our system and other products on the market allow you to configure with or without the vendor's assistance. If you are new to a Contract Management System, we recommend you lean on the vendor for the free assistance that they offer. Roles - this is typically a group of permission that you can assign to a role. 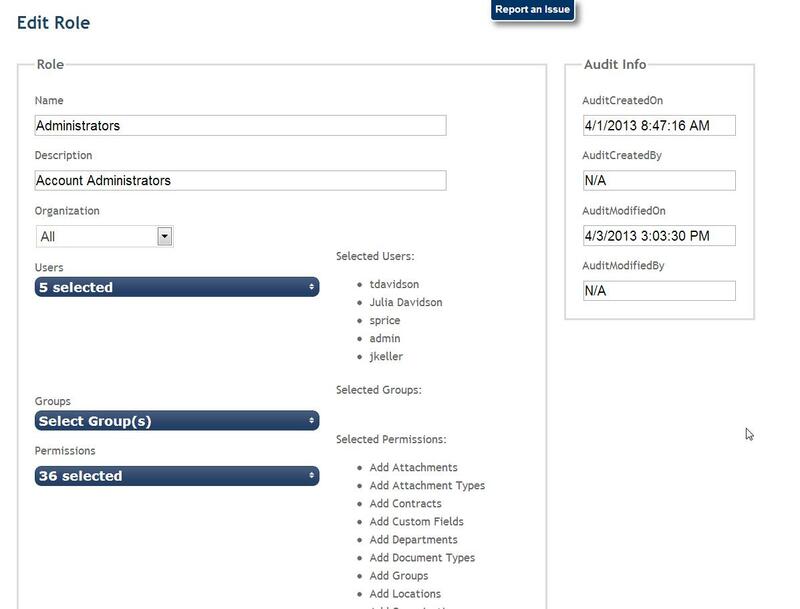 Permissions include item likes Add Agreements, Add Attachments, Delete Agreements, etc. Some systems have only a few options whereas others offer a more extensive permission list. Groups - this is often a great shortcut for managing security for individual users. Instead of assigning roles to a user, one assigns them to a Group and then assigns a user to a Group. Any user that is a member of a group, automatically inherits their permissions. One can usually be a member of more than one group. Contract Types and Custom Fields - No matter how thorough a system, the vendor can never anticipate every contract type or what content you need to capture today or in the future. Today, the leading contract management systems allow the contract administrator to create any type and specify what information they wish to capture. Other configuration items can include: contract statuses, parties and types, attachment types, task types, organization structure and definition, email notification standards, etc. Since configuration and customization are typically collaborative, we suggest you take advantage of the vendor's service and experience. .